What better way to start a new blog in a new year than with the very first CD I was sent in 2014? 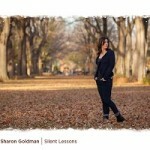 I was quite delighted to open my mailbox earlier this month to find the gift of Sharon Goldman‘s new CD, Silent Lessons. I had been seeing a lot of good chatter about this album from mutual friends on Facebook, so I was eager to hear it. The chatter is right – this is a very good album. A little shorter than most full length releases at just 8 tracks, it is still a deeply satisfying listen. Goldman’s voice is sweetly clear, her guitar playing is beautifully nuanced, and the songs tell well thought out stories. My two favorite tracks are the title cut, “Silent Lessons” (I’m a sucker for a good ballad), and “Pocket Full of Sun”. 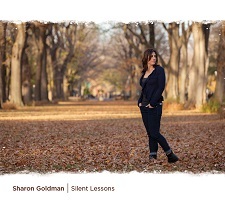 “Silent Lessons” is a contemplative song about truth and learning in between spaces, finding answers in the less obvious places where we don’t always think to look: “What do you see in the stillness when you feel blind/And you need all six senses to know what to find”. Give it a listen and let yourself think through what you hear. “Pocket Full of Sun” is a lively contrast to “Silent Lessons”, as it seems to be about noticing bright details. Here the sun is as much metaphorical as real, both something that can be tucked away to offset a not-sunny day and illustrative of any number of details through a day which might not be noticed but for being caught in sunlight. “The sun dances in a little girl’s hair/Her mother’s eyes squint in the glare/Then it moves along casting shadows on the concrete”. Remembering to take pause and notice those details, and then to be able to tuck them away for the future, brings brightness to any day. There is really no weak track in this collection. Each one has its story, completely told, and with its own mood. All of the songs are written by Goldman, except for “Her Secret” which was co-written with Amy Soucy. The only quibble I have with the album is that on the tracks with a band behind them, Goldman’s vocals get a little bit lost amidst all of the instrumentation. As someone with a moderate hearing loss, it makes a difference for me when the vocals are not as well separated or above the instrumentation. All in all, a very worthwhile listen. Check it out! This entry was posted in reviews and tagged female singer/songwriter, folk, singer/songwriter. Bookmark the permalink.